Location: Saint-Martin-du-Mont, in the Ain departement of France (Rhone-Alpes Region). 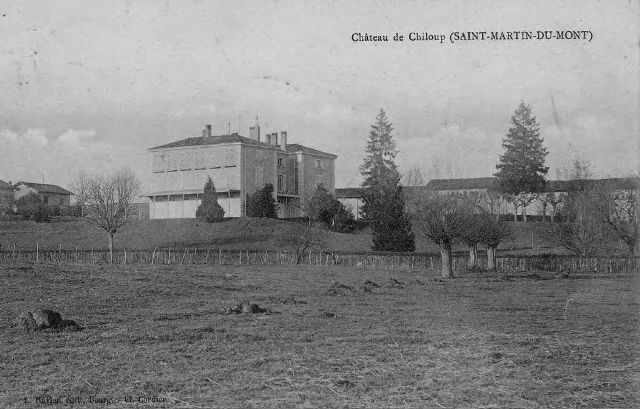 Notes: Château de Chiloup is a castle located in Saint-Martin-du-Mont in the Ain in France. The historic castle was destroyed in 1830, leaving a large square house, locally called "Castle Chiloup".The historic castle was a large square building with four towers and was Guichenon according to Samuel, "a fief of Varambon". According to Marie-Claude Guigue, the castle was a real strong house and originally belonged to the family of Chiloup the oldest identified representative seems Guichard Chiloup (around 1330). It lists among the successive owners, Bernardin de Molard, then Antoine Henri de Bignin cows. It is the latter which sells domain Claude Berliet in 1563 with the obligation to bear arms to Chiloup (gold three no mouth, a chief Azure). The castle and manages to Bishop Jean-François Berliet which transmits it to his nephew William Grizy. Note that his successor, his brother William Grizy, who died in 1720 is buried in the chapel of Our Lady of the Orme. In 1732, Henri de Saint-Martin is the owner. Thereafter, the Mury brothers are owners until 1804 followed by their nephew Jean-Jacques Durand Chiloup who was a mayor of Saint-Martin-du-Mont. It was he who to destroy the historic castle in 1830 and built on the same site the existing building.